For S&ME, a consulting firm specializing in engineering, design, planning, environmental, and construction services for the built environment, strong communication with both clients and colleagues has long been a key to success. But with 36 offices across the United States and projects throughout the country including everything from hospitals to industrial plants, to reservoir dams, many times staying in close contact means keeping in touch remotely. S&ME uses Skype for Business to facilitate their online meetings, which have increased in number by 80 percent in recent years, but poor audio quality was a nagging issue for the company. To resolve it, technology director Chris Headley turned to Sennheiser’s Team Connect Wireless to improve its inter-office conferencing. Headley needed a solution for the company’s mid-sized conference rooms that could handle up to 24 participants with far better sound pickup and distribution. At first it seemed like there was nothing suitable in the market, which was overrun with expensive hard-wired systems that were complicated to use and inflexible. Then, at an AV conference organized by S&ME’s AV service provider, Whitlock, Headley was introduced to Sennheiser’s TeamConnect Wireless mobile conference solution. TeamConnect Wireless is a portable wireless conference system for online meetings. Designed as a turnkey audio solution, it is easy to set up and use, and is both compact and flexibile. It also delivers clear speech and audio that helps make online meetings more natural and productive. A modern aesthetic ties the whole package together, including a touch-sensitive glass control panel that lets users connect and control online meetings. “It was exactly what I was looking for,” Headley said. He gleaned additional confidence from his existing familiarity with the Sennheiser from first-hand experience with other Sennheiser products, including microphones. 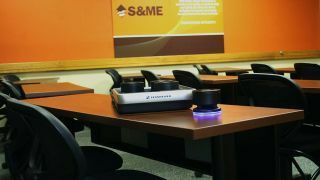 Sennheiser provided Headley with an opportunity to test the TeamConnect Wireless system on-site at S&ME without obligation. He seized the opportunity, and it quickly led to a decision to purchase a TeamConnect Wireless Case Set featuring four satellites units and facilitating up to 24 participant conferences. With TeamConnect Wireless, now S&ME employees are ready to conference anywhere, at any time. A member of S&ME’s IT department brings the set in its carry case to the relevant meeting room, then connects it to the PC, notebook, tablet, or smartphone located therein. With NFC-enabled Bluetooth Wireless, as well as USB/3.5mm jack, TeamConnect Wireless interfaces with a wide range of host systems. Though TeamConnect Wireless has only been deployed at the company’s main headquarters in Raleigh, NC, Headley said plans are already underway to acquire more sets for Raleigh and elsewhere, including some of the new two-satellite Tray-M sets for smaller meeting rooms. Headley is also still discovering new useful implementations of the system all the time, including using it to stream Christmas music to multiple rooms at this year’s Christmas party. “I suspect the Sennheiser developers did not anticipate this particular application scenario,” he said.